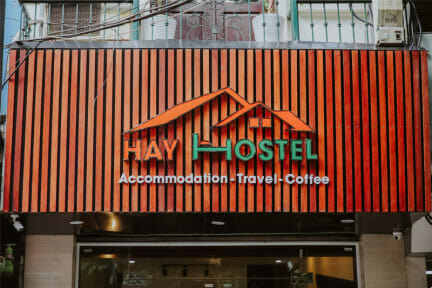 Hay Hostel is situated right in the center of Hanoi, 400 metres from St. Joseph Cathedral. 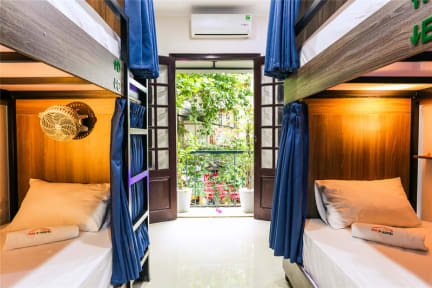 Practically located in the Hoan Kiem district, the property is located 400 metres from Ngoc Son Temple and a 6-minute walk from Thang Long Water Puppet Theater. The property features a shared lounge. At the hostel all rooms have a balcony with a city view. The private bathroom is equipped with a bath or shower and free toiletries. All units in Hay Hostel are fitted with a flat-screen TV and a hairdryer. An Asian breakfast can be enjoyed in the breakfast area. Nonstop assistance is available at the reception, where staff speak English and Vietnamese. Good location and friendly and helpful staff. I stayed in a double room which was excellent value. As it is a hostel, I could still enjoy the travelling vibe of a hostel. The breakfast buffet is very nice. The staff is extremely sweet and helpful. We had a lovely time staying here. I was going to stay for 2 nights but I extended it for 1 more night. The staff was exceptional, very helpful, accommodating and they even made the arrangements for my bus to Hue!! This is not a party hostel and is a few minutes walk to the party area which I preferred! The breakfast buffet was great, mix of vegetables and fruits were offered daily! The dorm beds were spacious and with curtains for privacy. The room lockers were huge too! Will stay there again for sure!! Had a good stay at hay hostel hoi an. The girls running the hostel are really nice and helpful, especially Julie and Hannah. Liked the location in the old town, too. Lovely staff, really clean and a good breakfast. Really nice to be a bit away from all the noise but still very close to everything. Really nice facility but definitely NOT a hostel. It is a hotel type accommodation with nice A/C, good english speaking staff and nice breakfast. They’ll be happy to arrange tours or taxi pickup for you. Happy to navigate you through the city and recommend places to eat. however, there are no common areas where to meet people, which means there is no hostel vibe. Location can't be beat! I rented a private room. It was spacious and overall very clean. The bathroom was a "wet" bathroom, with nothing separating the shower from the rest of the bathroom. At times I noticed a bit of a funky smell in the bathroom. The staff are very kind and helpful. Ask about getting a tour guide (free!). Breakfast was quite decent for a free breakfast. The big drawback to this hostel is the lack of anything that encourages interaction among guests.